Yesterday, I finally got up the nerve to say farewell to what was left of my corporate wardrobe. No longer taking up space in my closet are suits, long-sleeve collared shirts, or “business casual” sportswear. My dresser drawers are free of pantyhose, trouser socks, and sweater sets (wait, I did keep one black sweater set — but all the rest are gone). I haven’t worked in a traditional office in 3.5 years, but I was holding onto many of my corporate clothes out of fear. What if this writing and organizing thing doesn’t catch on? After the book went on sale Tuesday, it was like the clouds cleared and the sun came out — I could relax and let them go. Truth be told, I didn’t own many clothes before I started this process. I’ve pretty much only been wearing the same 10 t-shirts and three pair of jeans the past six months. The rest of the stuff in my closet was just hanging there, waiting on a giant “what if.” They were a security blanket I didn’t need. Also, most of the clothes were two sizes larger than I currently wear. If I had needed to change careers, they wouldn’t have even fit me. So, I cast them off — the Brooks Brothers suits are going to consignment and the shirts and sweaters are heading to Goodwill. I kept a very small handful of dresses and slacks for media appearances and when I do productivity training and organizing for corporate executives — but only five of those items. I weeded out my shoes, too. I feel lighter, more comfortable. In Unclutter Your Life in One Week, I talk about setting guidelines for your wardrobe to help you decide what can stay and what should go. The eighth item on this list is “You should have an occasion in the next year to wear it.” Thankfully, none of the clothes I’m getting rid of meet this definition. The item should represent your current style and the image you wish to project to others. The item should fit you well and complement your body type. The item should work in coordination with a minimum of two other items in your wardrobe. You should be able to wear the item with shoes you already own (for shoes, you should be able to wear them with clothing you already own). The item should be in good condition and should not need to be repaired. There should be space for the item to be properly stored. You should like how you feel when you wear the item (for shoes, they should not cause blisters). You should have an occasion in the next year to wear it. Do you have similar guidelines? Are parts of your past lingering in your wardrobe, acting as an unnecessary security blanket? Is it time to let them go? It sounds like they all needed to be gone on the basis of not fitting. Now you have some room for a few nice pieces to add that do fit your new lifestyle, for times when you need to wear something more than jeans and a t-shirt (funeral, wedding, flying first class, presentation, office meeting such as bank or lawyer, etc.). I’ll be interested to see what you decide would work for those pieces. I put clothes back in my closet from one end, and periodically (about once a year) I purge the ones that have sifted down to the other end. 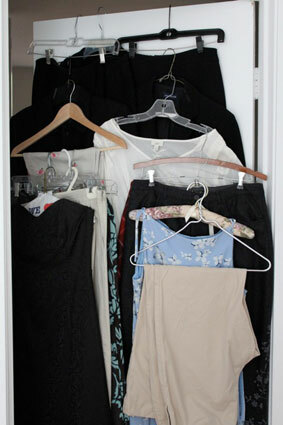 For those who organize their closet a different way, you can accomplish the same thing by putting the hangers on the rod backward to start and then replacing them forward; the hangers that are still backward after a year or two are eligible for purging. Well done – I still have some corporate work clothes and I haven’t been there for 10 years! These are the final really nice pieces that seem to keep me in a spell… I hope I don’t have to write a book to break the spell. Okay, you can’t just toss off a sentence with most “were two sizes larger than I currently wear” without some explanation! How has that come about? I’ve been working at a retail clothing store for the past year now, and the employee discount has given me great opportunities to update my wardrobe – and by update, I mean “replace/get rid of anything that doesn’t fit, doesn’t make me feel confident, or that I wore in high school (10 YEARS ago! )” It’s amazing what we hold on to “just in case,” isn’t it? I’m very happy that all my clothes, warm and cold seasonal wear included, fit into two dressers and a 2 foot wide closet. I don’t have to store (or forget!) anything in the recesses of the basement or attic, and even with so “little,” I have plenty to wear! I will admit that I own WAY too many clothes and yet I still end up wearing the same things over and over again… I am definitely planning to use this part of the book to inspire a closet make-over. It is long overdue! I’ve done this over the last six years–I moved from a position in university administration back to a teaching position, where I can dress far more casually. Over the last few years, I have passed on all my administrative clothes except for one dress–which can serve as my dress-up clothes if I need them. Your post has motivated me to get rid of the last three things I need to pitch–three nice shirts that I just don’t like to wear. They are going into the donation box as I head down the stairs. Thanks for the motivation! I saw the review of your book in USA Today this morning. Kudos!!! I have several suits and like to wear them even though my office dress code doesn’t require it. But to make sure I wear my office clothes evenly I started putting putting recently washing pants and jackets at the opposite ends of the closet. My internal rule is to only pick something from the fron two items. It works for me and helps keep things in rotation. Thank you Erin! I received your book yesterday and began reading it last night. I was so excited I didn’t want to put it down, but then I came to the sample worksheet about getting to work on time. I looked at the clock and realized I better close up for the night so as to avoid my usual morning scramble! This book is fantastic! I have found a wealth of information and ideas just in the very first chapter. I love your writing style and the organization of the process. Bravo. Looking forward to a lighter load! It *is* funny how we hang onto stuff because of “what if.” Thanks for this, I’ve been clinging on to some marginal dancewear and it is time to let some of it Go. I tend to buy inexpensive things and find ways to make them work, but at the prices I pay, I really don’t need to workaround more than two or three times. Plus, I’m well known in the local dance community so people tend to notice what I wear … too many repetitions, not good. Tough, I know! Congrats on the book and on successfully changing your life. My husband and I clean out our closets together. We take the ‘what not to wear’ approach: we try on items in question but we don’t look in the mirror, we look at each other. If he doesn’t think it flatters me and I don’t think it fits him well (he has had a significant weight loss), then it goes. This has really eliminated the emotional attachment issue as in “remember when I wore this…” Considering that we both love to shop for clothes, this has helped us understand what we have and what to look for in anything new. PS Love, love love this blog! Space is the biggest constraint for me. I have 1 closet and 1 dresser. I don’t have space even to store my clothes for different seasons; all my winter sweaters share space with my summer shirts, and my sundresses share space with my suits, though it’s all separated and organized. My rule is that, when I get 1 new (or new-to-me) piece of clothing, 2 old pieces leave my closet or dresser. That way, I go through my clothes regularly and don’t end up keeping things that are shabby or out of fashion too long. The “2 old pieces” part of the rule is because I used to have way too much clothing that I never wore but kept around just-in-case: the cases never came up. At this point, the “2 old pieces” rule has worked well enough that I may be able to change it to “1 old piece,” but I find that I like purging old clothes anyway. I do keep a couple of old dresses that I will likely never wear. They take up little space, and it makes me smile to look at them when I open the closet. I may consign or eBay them sometime, but I don’t mind keeping them because they don’t cause me grief right now. @Vicki — No exciting story. My doctor said that my cholesterol levels weren’t where she would like them to be and I was having lower back pain from bad posture, so I started lifting weights and increased my running schedule. I’ll never be itty bitty (I’m 5’9″, I look sickly if I weigh less than 130), but I am two sizes smaller than I was 3.5 years ago. If you haven’t taken them YET: you could consider contacting a local homeless group, to find out if there is a place for helping those down on their luck with job placement; many of them have trouble getting work due to a lack of professional looking clothing. I’ve been doing this same thing for the past year, as I also went down 2 sizes (due to type 2 diabetes which is now under control) and have been retired now for more than 5 years. All my “office clothes” were too big and I live mostly in jeans and t-shirts now, so it was pretty easy. There were a few things that I loved but since they no longer fit, it was not that hard to part with them. I gave most of the clothes away thru FreeCycle … http://www.freecycle.org. Erin, I just discovered your blog through the Zen Habits blog. 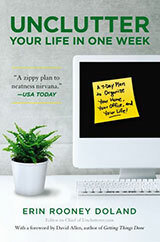 I like your writing style and practical advice, and I’m so looking forward to reading your book. Erin, ever since I bought your book, I’ve been on a mission. Each day I’ve been cleaning out the clutter from my house! I am amazed at how much stuff I was holding on too. My closet looks great! I now know what fits me in the closet. (plus I am going to make someone really happy with the clothes I will be donating to them) My bathroom is now organized! My husband doesn’t know what’s gotten in to me. Congrats on your book! Thanks for all of the great advice! I’m jealous! Congrats on being able to get rid of that clutter. When The Container Store did their annual 30% off Elfa sale earlier this year, we made the leap and did our closet. Best. Thing. Ever. SEVEN garbage bags of clothes between my husband and I, not to mention bags of regular garbage. And those t-shirts I can’t part with (Because I need the 1995 Fall Phish tour shirt. I do.)? Nicely stacked on a shelf – in my queue for a quilt. I’m on “Monday” in your book – it’s nice to see I’ve got one item already checked off at least! Erin, this is where I most need help! I haven’t worn a full suit since ’07 since I work as a stage manager and my “non corporate” corporate job doesn’t have the slightest dress code. But I tell myself I shouldn’t get rid of these good suits. So they…about 12 of them are in the back on my closet and haven’t been worn! I also have some seasonal clothes that I could due to part with but then there are some things..for example I have a dress in my closet since 2001 that I never wore. I thought of getting rid of it. Emerald green satin little dress! And finally this past July I wore it to dear friend’s wedding. And now I’m finding every excuse to wear it. I have a burgundy really pretty dressy skirt that I’ve also had since 2001. Price tag still on it. But I just can’t bare to give it away. I keep telling myself the time will come when I need it. OMG I’m so jealous! Good for you, you lost weight AND successfully work for yourself! I’m in the process of figuring out what to do with my wedding dress. I got married 4/08, and would love to donate it to a good cause. However, there only seem to be two out there, including Brides Against Breast Cancer. While this is a fine charity, I don’t really want to have to ship it away and include a check to cover cleaning. Does anyone have any other suggestions? Working Wardrobes is another fine charity that solicits business clothing (for men as well as women). Freecycle is lovely, too. Anything is better than having Stuff cluttering up the closet (and the mind)…except that I’ll probably never part with my 1961 just-like-Jackie-Kennedy Chanel-type dress and jacket! I also have 2 pairs of medical scrubs that I used to wear when I was a medical office manager. It sounds odd, but that period of my life was successful and interesting and seeing those scrubs on occasion makes me smile. We have a wonderful master bedroom closet so space isn’t an issue, but I am still very careful with not jamming the closet full of unworn and/or unwanted clothing. I don’t ever want it to get out-of-hand so I go through our clothes several times each year to assess what we have and what needs to go. Our church has a program that we donate to – to help those less fortunate and to hand out during the holidays to the homeless in our city. What I love most about this post is the timing. As you celebrate the publication of your first book, it seems as if you are freeing yourself to leave behind the past in terms of the corporate work “fallback.” In doing so, you can now let go of the clothes you don’t need…and which can be used by others who really could not afford their original prices. It’s also reinforcing your commitment to your present and future as a creative entrepreneur who doesn’t need those clothes because they no longer literally and figuratively do not “fit’ who you are and have become. FYI: There is nothing more satisfying than giving away good clothes, in great condition, and knowing that someone who needs them will find them. Whenever I get hung up on clearing out clothes or anything else still in good working order, I remind myself that it is just “wrong” to hang onto stuff and not use it when somebody else could. Particularly in these tough times. I used to love freecycling but today, unfortunately in our area, the people are not taking for personal use but are being taken by people with plenty of money who then want to resell the stuff. That’s not my intention when giving something away. I want someone who needs something to have it. This is not like recycling cans. I am soooo motivated now. I am going to fill up two garbage bags to take with me to the Department of Juvenile Justice today–I teach improv to some girls there, and a surprising number don’t have access to proper clothing for when they are released. Y’all might consider the juvies. I have been in the process of whittling down my wardrobe to just what I truly love ever since I gave birth last year. I used that as my motivation/excuse to get rid of stuff I’d had forever and buy new things that fit my current situation. It has been a blessing! With less clothes in my closet – but all stuff I love – it is actually easier to get dressed in the morning. @ Clair- try your local theater-community or college or high school program- depending on its style or if it can be reworked, many small theaters and school theater programs might appreciate the donation. I have not worked in a “suit” environment for years, either, but I do keep one classic black suit on hand. I call it “The Funeral Suit” and that is when I wear it. Oops, I meant ‘Claire’. Sorry! Must be hunger pangs- better get lunch! I find the usual rules don’t work well for me, the best example being “If you haven’t worn it in a year, get rid of it.” I expect to work in an office till I retire and dress codes vary So I keep my suits even if my current job is casual. For me it worked out well – after many years in a software company (casual) I now work for a large company (suits or jackets). That said, I keep my wardrobe within bounds. Usually the bounds are whatever closet & dresser space I have, and no seasonal switching. Once a decade or so I do a wardrobe re-do, examining clothes for fit, wear and fashion. It helps that I prefer classic to trendy and don’t care if I wear a suit for 15 years. Unfortunately I’m really good at getting every bit of use out of space so my storage bounds can get rather full. That’s when I call a friend in to help me assess. SLY: I had the same problem with just in case till my friend pointed out that they’re not doing anyone any good in the closet and did I need _all_ of those clothes? So I donated 75% and kept the rest. Is there a Dress For Success in your city? They’re in desparate need of women’s work clothes to help women get interviews and jobs. Lauren has a good point: if you have so many clothes that you don’t know what you have, it’s hard to find what you want. Claire…. I suggest you consign the dress and give the money you get for it to a worthy charity of your choice. It sounds easier and a local lady will get to give your dress another special day! As for the post, you have hit a tender spot with me. I too had an office collection of garments that I no longer wear now that I work from home. I have a few business networking event suits that I have kept, but most of my favourites I have “outgrown” since having 2 kids. I was sad to part with them, but I am comfortable with my current size so not TOO sad to pass them to charity. I have a couple really snazzy dresses that I have no prospects of wearing, but they are just too lovely that I can hold HOPE that I will get invited to a Gala soon! SHOES are a whole other topic! I have lots of super-cute shoes that are not comfy. I specifically wear them to things I know I won’t be doing much standing or walking at. I did take the leap of decluttering faith and get rid of the real blister makers though!!!! I miss seeing their sparkling charm in the closet, but I don’t miss the agony of wearing them. Lets face it you can’t look awesome if your hobbling. I really hope no one takes this the wrong way, but even when you are a casual dresser with no need for “corporate” clothes, please remember that faded, stretched t-shirts and jeans aren’t really a good look for ALL aspects of your life. Even running to the bank or meeting friends for lunch, doesn’t dressing a bit nicer make you feel better and more confident? It does for me. I second the funeral suit. I’ve had to buy clothes and shoes appropriate for a funeral when a family member in another city passed away unexpectedly. I ended up going to a department store on my way to the airport. Very stressful. Wow! I’m still waiting for your book, having only found this website yesterday. I like the blog because the comments add a lot to what you write, being able to see other people’s thoughts on things. I was able to ditch the suits and I do fit within my closet and dresser. But I still seem to have a lot more pieces than I wear. Reading through I realized it’s because I never adopted a new style, uniform, whatever you want to call it. When I dressed up it was slacks, top and blazer. But now it could be jeans and sweaters, gear for Hawaiian day, a fun skirt and top. So the pieces proliferate because I don’t have one look and things don’t always go together. So now I know what I need to work on. Perfect timing! I just made a huge pile of clothes I’m selling to a Plato’s Closet (I’m a senior in college so I need the money, haha), and it’s so nice to get rid of them. I have a tiny closet (where the hangar bar faces forward (front-to-back), instead of to the side (left-to-right), so I have to squeeze into the closet to see what’s in the back) and only three drawers in my dresser (my boyfriend uses the other four), so I didn’t have much room to begin with. It still seems like it’s packed, though; I don’t know how I fit it all in before. So, when we retire we can wear jeans and tees. Oh, THAT’s why my husband insists on saving his collection of 50+ 1970’s tees. He not only thinks he’s a lot closer to retirement, he must think he’s going to live forever! I need to do that, too! I left my high-stress corporate job 2 years ago….but I’m still scared that I might have to go back if my little business doesn’t make it . . . and it’s still too early to really tell. Hopefully, next summer — I could use the space in my closet! I’ve rec’d my copy of your book and love it. I’m going to read it through and then gift it to my BFF (she needs it badly). Have you sent out the email with the worksheets? I never rec’d mine….? Thx for all you do! I’m getting ready for a move, and my wardrobe is the biggest issue for me. I’ve been waffling on buying your book for awhile now, and this has just finally decided me on picking it up–getting ready for this move, and trying to do it all as minimalist as possible, is a big stressor for me. Uncluttering is a HUGE help, and the wardrobe… well, as a college student who used to work in corporate america, I can probably get rid of my suits that are 3+ years old.. and some of the older things. But oh! the anguish. I just got your book (on the Kindle – which, if you’re not completely enamored of paper books, is an amazing little device) and am loving it. I too recently weeded my closet and the most hilarious aspect of mine was that I had all of these “work clothes” hand-me-downs from my mother. I was in junior high at the time and they didn’t really fit, but she assured me I would eventually grow into them so I’ve kept the whole lot – even though the basic problem is that she is shorter than me with narrower hips and a bigger chest and how the heck am I supposed to “grow into” suits/dresses too short and cut completely incorrectly?? Anyway I’m 22 now and am pretty certain I won’t be going from C cups to DD anytime soon, so all of her nice clothes are off to find someone who will be able to actually wear them. @Claire – If space is the issue, you should have your wedding dress cleaned and boxed. I couldn’t imagine parting with mine, and I hope that one day my daughter will want to wear it. You are kind to donate yours, though. @Gregory – So true. I had a friend who once asked if I ever wore jeans. Which I found interesting because I wear jeans a lot (I stay at home). More recently, another friend remarked that when I wear casual clothes, I still look stylish (which I guess is why people don’t notice that I dress comfortably). In my opinion, dresses are the most casual and versatile things a woman can wear. They are instant outfits that require little styling and are appropriate in nearly every situation. So that said, dresses comprise most of my wardrobe. And while I do follow Michele’s rule (out with the old, to make room for the new), I tend to hold on to my collection of dresses in the hopes that my daughter will want to wear them someday. I remember wishing my mother and grandmother had held on to some of their more classic clothes. Congratulations on removing the “enemies” in your closet and creating a closet full of “friends.” I did this a couple of years ago and it makes going into my closet a much happier and stress-free experience. The 80-20 rule of life applies to clothing too. We wear our favorites (20 percent of our wardrobe 80 percent of the time), and the other 80 percent of our wardrobe is anxiety-producing stress and clutter. That’s great you’ve lost weight. Please post pictures. @Ariana — Honestly, I look about the same. I can fluctuate anywhere between 130 and 165 and it doesn’t seem to affect my appearance much. @Sara: I suspect that giving your her clothes is your mother’s way of getting stuff out of her house without the pain of actually getting rid of them. 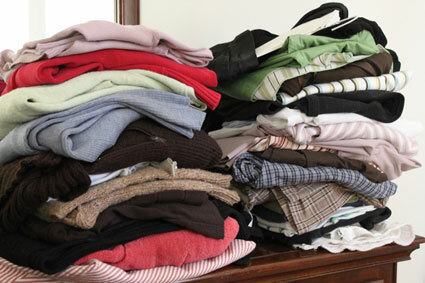 I recently did this and posted about it on my blog (The Great Clothing Clean-out Project). It’s amazing how freeing it can feel. I cleaned out my closet as the first step in my decluttering process. I’m looking forward to reading more from you! Professional organizing is something I am very interested in. Thanks for sharing your ideas with your readers. @ the women who are holding on to clothes in hopes that their daughters will wear them: Forget about it. Chances are they won’t want to wear them due to style reasons, or because they won’t be the exact size. No offense intended, but this just seems like a sentimental excuse for not decluttering. @Kitryan–Is it possible to give clothing to a theater group with the caveat that you can rent a piece back occasionally? I have good evening wear, classic, that I’ve had for 25 years, purchased at bargain prices, that I only wear every two or three years. I’ve been a reader for a long time, and I’ve noticed that every time Erin makes a point of mentioning her weight, several people focus on that (totally off-topic) aspect, wanting weight-loss tips, ideas, clues, hints, or as above, photos. Or a clothing post will devolve into an argument about how women gain or lose weight as justification for keeping or purging clothing. Quite frankly, I don’t see why anyone would inquire into what Erin weighs besides Erin and her doctor, or ask for photos as if she was a pin-up, and last time I checked this wasn’t a weight-loss blog. 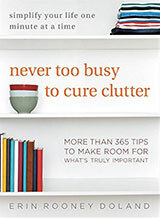 How about more unclutter from the readers, and less Erin-weight-watching? Let’s give the woman a break from the microscope, shall we? @RV — hear, hear! There isn’t one item of my mother’s wardrobe that I would want to wear, whether you’re talking about an item she has now, or an item she had in the 1960s, ’70s, ’80s, or whenever. Not even her wedding dress. She kept it, and the length was OK for me because I’m only about an inch taller than she is. But my shoulders are wider. There is no way her dress could have been altered so that I could wear it for my own wedding. Ha ha! this discussion reminds me of an incident I had with my then teenage daughter. I let her look through some clothes I had been unable to part with but were too small for me. She chose a skirt that I just loved, and wore it, but she wore it on her hips, not at her waist like I thought it “should” be! Her response was that the skirt didn’t know the difference, and I had to just shut up. It was a beautiful well made piece that got a great deal more wear before she passed it on to a friend. I’m pretty sure I’ve referred to this in past posts, but it was very freeing for me when I started working at a grocery store as a cashier (and later as a Customer Service Manager), because all I needed for work was a black (T-shirt = OK) and black jeans (or other black pants) to wear under my black uniform smock (which actually looks more like a boxy suit jacket than like some of the more unfortunate retail smock designs). I’ve actually found myself wanting to wear slightly nicer clothes on my days off, because I dress so casually for work! But it’s very freeing–monetarily as well as mentally and spiritually–not to have to keep up with a corporate “professional” image. That was supposed to say “black shirt.” Something got lost in my editing… been reading too much about minimalism, maybe…. I just lost 55 pounds (consistent exercise & healthy eating) and got rid of nearly all my clothes. I donated most things, though I admit to tossing the undies – ick on sharing those. I’ve loved buying new clothes for the thinner version of me, but have focused on essentials that will wear well in a variety of situations. A good tailor helped remake some favorite items at a fraction of the cost of new clothes – he remade one skirt 4 sizes smaller and it looks like new. He even remade my button-down blouses – far less expensive than buying new. Symbolically, giving away the clothes was a personal commitment to keeping the weight off. Your post made a lot of sense to me – and I wanted to share my little story. Interesting topic that you touch on about the issue of what to do with your corporate wardrobe. I have recently transitioned to working at home, and I put away my corporate clothes to a separate pile. But its still early days for me to part with them. At least I have made a start!